“A serious writer,” says Chinua Achebe, “must look for an animal whose blood must match the power of his offering”. Writing, Achebe implies, is akin to sacrifice. To commemorate Nigeria’s one hundred turbulent years of nationhood, Anyokwu brings to the altar three plays, bound in a volume aptly entitled Blood Lines & Other Plays. In the African traditional religion, the task of the diviner is threefold. He begins by showing his caller the root of their problem, and expands the discourse by showing evidence of its existence, and then ends by pointing to the solution. Considered together, the three plays in this volume follow this divination pattern. The first play, “Blood Lines” is a riddle on many counts. The major character, Chief Ogie, is a superbly educated banker who is about to be appointed Governor of the Central Bank. When the play opens, he is about to take a third wife, even though he is aware he suffers from an ailment that prevents him from making a woman pregnant. “The larger the better,” he tells his first wife, Atunne. He encourages all three of them to seek lovers outside his home – an arrangement that gives them several children. When it becomes apparent that his bid for the Central Bank job will be successful, he begins to receive text messages from unknown persons who claim they have “damning information” about his past and about the “arrangement”. Only then does he become worried. In his search for solution, he is led by his close friend and driver, Ehis, to a cult group where he is to learn that it is, in fact, Ehis, who is the father of all his children and originator of the text messages. The group, however, promises to help him secure the position of Central Bank Governor. The next scene shows Ogie in an elaborate ceremony. He has clinched the coveted position. We are told in the closing scene that at a second party in his city home, a mysterious fire broke out and destroyed all his possessions, leaving him in a sorry state, possibly paralysed. If “Blood Lines” is concerned with a form of personal failing, the second play, “Citadel” explores a crisis of a more systemic nature. Dr David is a forward-looking university teacher whose passion for new ideas pits him against Professor Sogo, a senior member of his department. Where he prefers to inject elements of “Popular Culture” in his literature classes, Sogo favours the “Classics”. “You can take your kitchen-sink drama and prurient garbage elsewhere. You cannot practise your schizoid art here,” he yells at David. This hostile work environment encourages him to apply for fellowships overseas. He soon receives an offer from Germany which also allows him to travel with his family. But it is at that time that he suffers a breakdown. The closing scene shows him recovering remarkably at a psychiatrist’s, surrounded by his family. They speak of resuming their preparation for the travel, as the play ends on a note of hope. But it is this hope – or, its more enduring form, salvation – that is the subject of the final play, “Facing Mount Ebo.” A deeply spiritual play, it dramatises the chaos that results when the past is divorced from the present. Many young men from the town of Akaba have strayed to the city and started the business of “cart-pushing”. One of them, Irorere, meets Eboigbe, a pastor, who preaches to him about Salvation at a road junction. They learn in the course of their conversation that they are from the neighbouring towns of Ogan and Akaba. The pastor, who was raised by his mother in the city, believes he comes from Ogan; he remembers, however, that his mother called Akaba “Ebo” which means “curse”. Irorere, meanwhile, suspects the pastor is, in fact, a native of Akaba: “For one thing,” he tells Eboigbe, “your accent…is exactly like mine… You might for all we know be an Akaba man. Like me.” A search for an answer takes them to Akaba. Here, Eboigbe learns that he was, indeed, born in Akaba. His mother had left with him for the city after his father, Ufoi, was unjustly killed by order of the king, nearly fifty years before. Before his death, however, he cursed Akaba and called it, “Ebo”. The play ends on a sombre, but celebratory, note: the curse is reversed, and members of the community begin again to experience peace and prosperity. The problem we encounter in the second play is a very present one. Dr David’s university is a society that desires change but is totally averse to it. “So you take the fun and leave the learning?” queries Professor Sogo. “Or put differently: you make the fun the learning? How do you move culture and society forward with your thematisation of fun?” It is this contempt for “fun” or change that stalls development, Anyokwu argues. But it does more: it wrecks the mind, and drives talents away. It is also the playwright’s argument that there is a collective, ultimate, destination for the nation, and that for that transition to be possible, a kind of soul-searching must precede it. Like the Biblical Mount Sinai where Moses received the Ten Commandments, “Mount Ebo” is a place for answer, instruction and ultimately direction. For Pastor Eboigbe, it is even more instructive – it was a place once despised; he was raised to see it as a curse; but it is to become the place of his freedom. Ultimately, his story is reflective of the saying that the man who holds another to the ground also keeps himself from rising: it is only when the curse is broken that the pastor, whose father pronounced it, regains his freedom and is blessed with a child. The audience will find the masterful use of Nigerian pidgin and urban colloquialism in many parts of the plays particularly refreshing – “Now we have fine-fine roads”; “…with money like san’ san’ flowing…”; “Do you want me to miss out on the wedding of the decade, with all the food, drink and all? Lai-lai, thank you very much”; “How about her ikebe? …Na helele, my sister”; “I swear to God who made me”; “Yes o my sister”; “And if it is a girl, your own don finish”; “So, no cause for control. Everything is under alarm”; “Are you a child that I should use all my mouth to say it?”; “You think it’s moinmoin?” “Like seriously?”; “Na IGG! Initial Gra-gra”; “the roforofo fight”. A final observation concerns the playwright’s depiction of setting, culture and identity. Different local languages appear to collapse into one another – influences from Bini, Yoruba, Igbo, Ika, Itsekiri, and so on. Ogie speaks enthusiastically about “Ogbono, edikaikon, oha, ofe nsala, ewedu and gbegiri, and tuwon shinkafa”; and, somewhere in the interior parts of Bini, Ogie and his family speak of swearing an oath before Ogun, a Yoruba god. But much of the action in the entire drama is, indeed, set in Bini – a cultural melting pot, interspersed, as it is, by different ethnic groups. This multiculturality is emblematic of the country’s age-long struggle to achieve unity in the face of diversity. These plays, then, are about closing barriers – filling gaps. “Blood Lines”, a compound often written as a single word, is here separated – a graphic representation of the past at odds with the present. The plays are restorative: attempts are made to find answers for the purpose of healing old wounds. Indeed, by the time the lights finally fade in the final play, a mandate has been secured for the collective future of a people. Can the Literatures of Dystopia Convey Messages of Conscience? Not read the books yet, but I like the review. Texts dissolve into one another. Plus their diagnosis of the Nigerian condition. A big thanks to you for reading it and leaving such kind words. I have read all the works of Dr. Chrisropher Anyokwu, except his prose fictions (Old Solja and Other Stories). Personally, I feel this new collection of Plays, Blood Lines and Other Plays, could be said to be better than his previous works! But this is only expected of someone who is not only an artist, but also a seasoned teacher, as he prefers to call himself, and a critic with an acute analytical dexterity. The man, Christopher Anyokwu is not only my mentor, but also an epitome of what new generation scholars should be. Reading his works, such as Ufoma, Stolen Future, A Parade of Madmen, Beyond the Wall, Night Rain, Camp Hope, and, now, Blood Lines and Other Plays, only lead me to the conclusion that the dramatist is a critic of the society. Given his admiration and critical works on Niyi Osundare and Wole Soyinka; given his vast knowledge of African Literature; given his interest in an improvement of critical and artistic prowess amongst the current generation of writers and scholars today, I can only say the sky is just a footpath for him…I only fear for the Nigerian system, which, if care is not taken, as is the case with Dr. David (who, it can be argued, cuts the image of the writer himself in terms of mannerism and language-use), may loose this rarity of a gem (Chris) to foreign citadels of learning. Reading the works helped change my perception of Nigerian culture and drove into my consciousness the NEED to search for my own identity, as it might just be the solution to the conundrums puzzling my existential reality. As Anyokwu has written in one of his essays, ”art is life and vice versa”. Literature, as Ezeigbo reiterated in her inaugural lecture, is a reflection of life’s realities–which includes its past and present, which the artist must engage with, for, as Niyi Osundare notes in his preface to his The Eye of the Earth, “in the dialectics of human living, looking back is looking forward, and the artist is not only a rememberer, but also a reminder”. If Anyokwu has chosen to preoccupy himself with the quotidian realities that still besets the progress of Nigeria after a 100 years of ‘nationhood’, then, in Anyokwu’s voice, what is that lecturer talking about? Moreover, as Donatus Nwoga has argued, if we are to limit our category of literature based on thematic concerns, all literatures will probably a long list of repetitions and re/copying (Achebe’s Things Fall Apart, Arrow of God, No Longer at Ease–J.P Clark’s “Abiku”–Adichie’s Purple Hibiscus and Half of a Yellow Sun–and indeed, all post-colonial literary works–to scratch the surface only, would be one and the same, for that matter). Hence literature’s substance is not only in the WHAT (thematic concerns), but , perhaps more importantly, in the HOW (technical concerns). Hence, though he may be said to have touched old subjects (of course that lecturer considers the issues contained in Citadel as old also), Anyokwu does so in his own style and aesthetics, he thus qualifies as not only a playwright, but also a teacher. Okoli, nice review. You are also my mentor, having read some of your literary works in the books mentioned in your profile here, and also sharing in the legacy of madness Nigerians are faced with today. I look forward to meeting you in person. Many thanks, Alfred, for the juicy insights. I look forward to meeting you too. 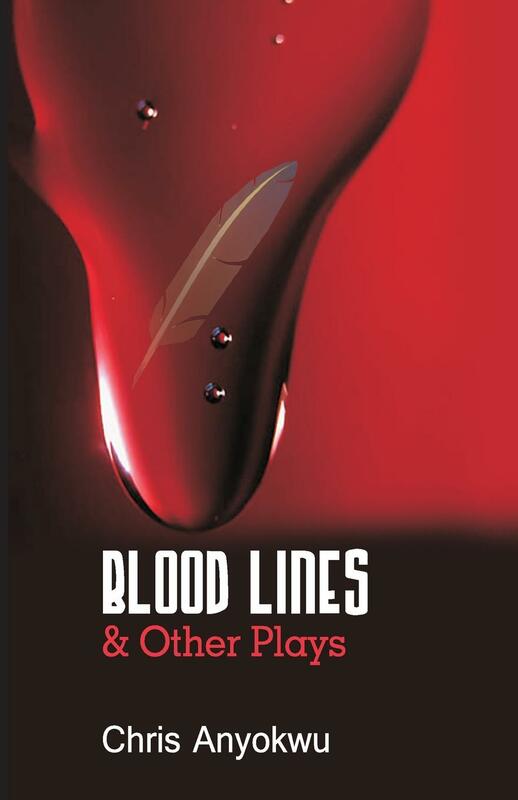 Blood Lines and Other Plays captivated me; I couldn’t drop the book while reading. Dr. Anyokwu really penned those stories from a very rich and culturally oriented imagination. Nice analysis.